The Crafty Nurse back with you for a little inspiration from Pat's August release. 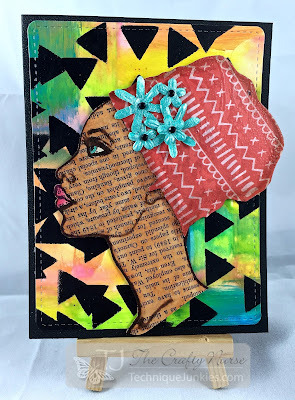 Today, I'm featuring another card I made using the Let's Face It Palletini Collection. This stamp called to me and I had a blast coloring her. The background started with Distress Paint in Squeezed Lemonade, Mowed Lawn, Mermaid Lagoon, Picked Raspberry and Spiced Marmalade. Once that dried I applied black paint through a Heidi Swapp Stencil using the "Stencil Turn" Technique on the Sensational Stencil CD. For her headpiece, I stamped it on Amy Tangerine's Rise & Shine paper and clear embossed. I fussy cut the head piece and applied it back onto the image. Once everything was dry, I applied Tim Holtzs' "Distress Glaze" because all my mediums were water based and I didn't want it to run when I applied the Gel Medium. I then created some depth using a Pitt Artist Pen in Brown around her head piece. This is a great way to complete your paper piecing so it doesn't look disconnected or out of place. To finish, I colored the flowers with more FW Pearlescent Paint in Waterfall Green and called her done! I'm thrilled you stopped by the Technique Junkies Design Team Blog today and sure hope you've had a chance to check out the new August Stamps at the Technique Junkies store because there is only a few more days left for our August sale!